The “Do Not Track” option is enabled by default in Windows 8’s Internet Explorer 10 and available in Firefox, Safari, and Opera. Google is even adding it to Chrome. There’s just one problem: it doesn’t actually prevent tracking. The Do Not Track check box can provide a false sense of security. While a few websites will pay attention to it, the vast majority of websites will ignore your preference. Tracking takes a variety of forms. Websites and the advertising network scripts they use track what pages you visit online and serve you advertisements based on your interests. For example, if you visit a website for a specific product and then surf to another website, you may continue seeing advertisements for the product you viewed earlier. if you search for information about Android, you may see Android advertisements on other websites you visit, even if they’re not technology-related. This data about you may also be analyzed or sold. There are also more basic types of tracking – for example, websites can see which pages you visit on them and how long you spend on each page. This can help websites determine what their visitors are interested in. Your browser uses HTTP to communicate with websites. When you enable Do Not Track, your browser includes the “DNT” HTTP header with a value of “1” whenever you connect to a website. The value of “1” expresses your wish to opt out of tracking. In other words, when you enable Do Not Track, your browser sends a request asking the website not to track you each time you connect to a website. All browsers except the current version of Google Chrome have this option, and even Google Chrome will have it soon. For example, it’s named “Tell websites I do not want to be tracked” in Firefox. By default, web browsers use the null value, indicating that you haven’t expressed a desire of whether you want to be tracked or not. 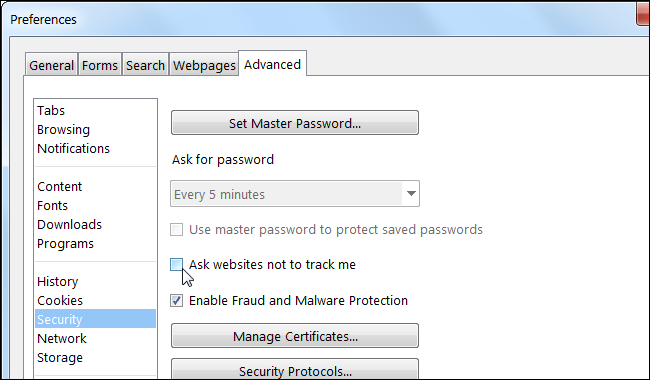 The one exception is Internet Explorer 10, which automatically enables Do Not Track. This is extremely controversial because it violates the Do Not Track Standard. The Do Not Track standard is designed to allow users to indicate a preference, and the authors of the Do Not Track specification and the Digital Advertising Alliance both disapprove of Microsoft’s choice. If Do Not Track is on by default, they argue that there’s no way to know whether the user has actually expressed an individual preference. Roy Fielding, one of the authors of the Do Not Track standard, updated the open-source Apache web server to ignore Do Not Track signals sent by Internet Explorer 10 for this reason. Enabling “Do Not Track” doesn’t change any browser privacy settings. When you enable Do Not Track, your web browser asks each website you connect to please not track you. The problem is that most websites simply ignore the “do not track” request. Websites have to be updated to pay attention to this field, and most websites aren’t interested in obeying it. Most websites simply ignore the Do Not Track field. Among websites that listen to the request, they’ll react to the request in different ways. Some will simply disable targeted advertising, showing you generic advertisements instead of ones targeted to your interests, all while tracking you and using the data for other purposes. Some may disable tracking by other websites, but still track how you use their website for their own purposes. Some may disable all tracking. There’s little agreement on how websites should react to Do Not Track. Currently, Do Not Track is completely voluntary. In the future, it’s possible that some countries will pass laws forcing websites to obey this preference. It’s also possible that some advertising or business organizations may require their members to obey this setting. The debate over tracking is a thorny issue – for one, tracking can be used to display ads for products you’re interested in, such as ads for tech products instead of ads for diapers. These ads also help fund websites. If Do Not Track is enforced by law, the web will likely still be full of websites that track you. They’ll be located in other countries where adherence to Do Not Track isn’t enforced, just as our email addresses are constantly receiving spam in spite of spam being illegal in many countries. This can cause problems sometimes..
Adobe just have an option, when you view videos, to deny the provider/other sites, to obtain information from your computer. "DoNotTrackPlus is rated “Outstanding” by CNET. Over 1.5 million downloads, and the most powerful privacy product on the market. Get DoNotTrackPlus and stop ad and social networks from secretly tracking your every move"